Tree Wall Murals: Your Thoughts? 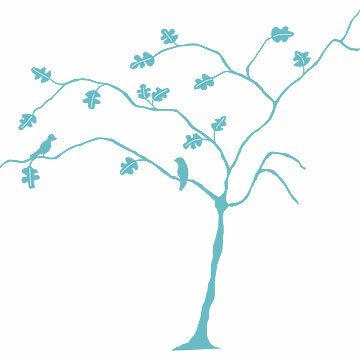 I've been watching Catherine over at the Scrappy Girl blog pull together some concepts for a tree mural she'd like to have on her bedroom wall, extending onto the ceiling. After giving it much thought, I think Catherine should select a blue that is about 2-3 shades darker than her current wall color and free hand a tree silhouette that way. It would take a lot of the 'pain' out of the execution, given that Catherine isn't a fine art painter (neither are most of us for that matter) and I'm sure she's nervous about applying brush to wall. I'd suggest using a template on an overhead projector and penciling it on the wall, then filling it with paint. Here's a few visuals for you if you're not following me here. Of course, this template was designed with a baby in mind, but you could find one that is more grown up, minus the birds, of course. I love the idea, especially extending over the window. Looks a bit like the same corner Catherine is looking to place the mural. Cathy, what do you think?